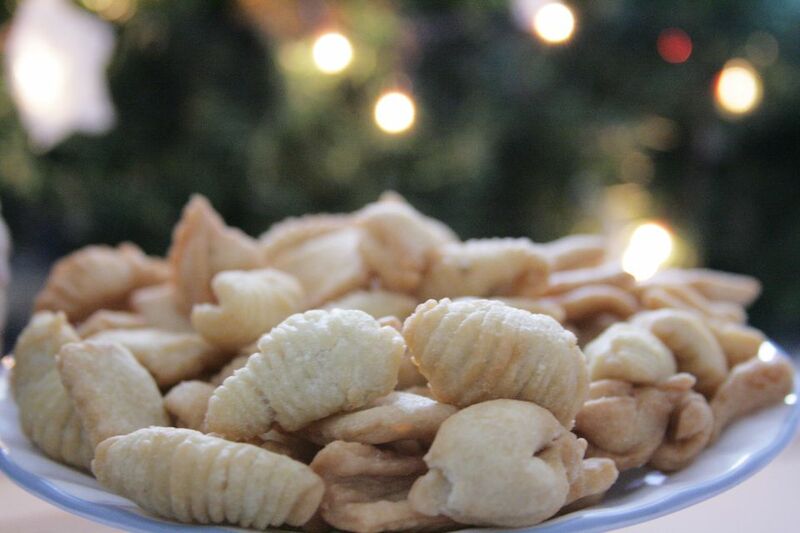 Kulkuls, a great sweet to prepare with the family, are made all over India at Christmastime. They are most popular in the Goan region and may have come from the Portuguese community as a variation of Filhoses Enroladas, a rose-like rolled pastry. Kulkuls are often called kidyo in the Konkani language, which means worms. That's not very appetizing, so it's more appealing to think of them as shells or curls. These Indian sweets are fun to make with the family; it takes time to roll each one with a fork, so you might want to enlist older kids or teens to join in. That way you'll be able to make a larger batch! They keep very well if stored in an airtight container, so you can make them ahead to enjoy for the holidays. Kulkuls are a traditional part of a sweets plate and ideal to give to friends and neighbors. You can also make them part of your Christmas cookie exchange. In a bowl, mix the flour and baking powder well. Add the butter a little at a time, mixing gently until the butter is pea-sized. Add the powdered sugar and coconut milk and mix into a soft dough. Form the dough into small sized balls. Grease the back of a fork with some oil. Flatten the ball of dough and press it onto the back of the fork, forming a rectangle the length of the back of the fork tines. Starting at the bottom end of the fork, roll the dough up the tines and off the fork and into a tight curl. The end result will be a tube-like curl with the ridges from the fork on it. Place the curl on a plate and work the remaining dough similarly until it is all used up. Heat the oil in a deep, heavy-bottomed pan over medium heat. When hot, fry the kulkuls, making sure to turn them often until they are a light golden brown color. Drain and cool on paper towels. Put the granulated sugar and water in a separate pan and cook until the sugar is fully melted and a syrup forms. Add the cooled kulkuls to the sugar syrup and coat well. Remove and allow the curls to sit on a plate until the sugar is encrusted on the kulkuls. When fully cooled, you can store the ​kulkuls for a considerable amount of time if kept in an air-tight container.